What is the connection between human and animal rights? 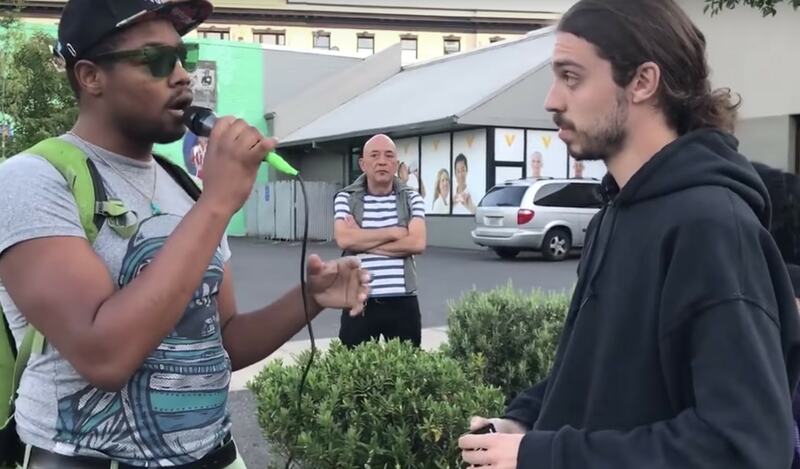 That issue was tackled during a street debate captured on video between Earthling Ed and an unnamed human rights activist, speaking about the oppression he has experienced as a person of color. The unidentified - and eloquent - activist took the mic and said: "I've got something to say...The unity that we need right here is to take care of our human animals, so we can take care of the other animals that are on this planet. You worry about how they are being treated. How about...how we're being treated?" He added: "Do you understand how I feel? I have to walk around on eggshells because I don't know if I'm going to get killed - for being me. "Do you understand that there is major oppression happening to all cultures, by those who have benefited from that oppression? "I'm mad, and I stay enraged because I see how you don't care...you can't just sit there and hope people get it. You've got to make them get it...I'm not mad at you for what you're doing, but I see the rhythm - the consistency of dealing with other animals and things - we're not dealing with ourselves. Is that too daunting, to stand up for people?" In response, Earthling Ed says: "The way we see it is that all oppression is interconnected. Just because we do bad things to humans doesn't mean we should treat animals with disrespect. "If you raised every child on this planet...and said 'that life of that chicken should be granted with respect and they should be allowed to live that life, and you said that fish in the ocean...should be allowed to live the life they want to live in the ocean without human oppression or exploitation, then do you think that child would ever grow up to oppress another human? "If they thought that all species or all beings regardless of how they looked, or if they had feathers or scales or wings or whatever form they took, do you not think that child would learn to respect all life including our own? What you say is completely true...and your anger is beautiful because you stand up and you care."